Plastic pollution can be likened to an indestructible monster that rears its ugly head everytime you cross heaps of discarded non-biodegradable trash that is taking over our cities. It’s easy to see why plastic is such a hit; it is convenient, does its job well, and is so versatile that it can be used pretty much everywhere in everything. But once its work is done and discarded, it poses a massive threat to the ecosystem – something many of us like to forget for its sheer usefulness. Earlier this year, the Maharashtra governmentdecided to impose a ban on disposable plastic items, making it the 18th state in the country to take such a drastic step towards environment conservation. However, a ban such as this can only be implemented effectively when followed up with equally effective execution –– quite a feat in a city the size of Mumbai that houses more that 1.5 crore people. To make things a little simpler, Maharashtra State Innovation Society along with Floating Canvas Company, a Mumbai-based creative start-up set out bring about awareness about responsible disposal of plastic waste with their installation of a ‘Plastic Monster’. “A monster that can only be defeated with awareness, collaboration and positive action,” reads their tagline. The installation titled ‘It Never Goes Away’ is conceptualised by Mumbai-based visual artist SAGE, and has been executed by Arthat Studio. The initiative is also supported by Municipal Corporation of Greater Mumbai (MCGM) and Maharashtra State Road Development Corporation Limited (MSRDC). 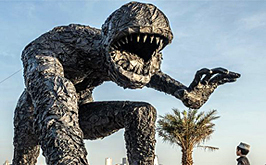 Inaugurated on March 5, 2019, the 26-foot-tall installation is located at Bandra Worli Sea Link promenade and shows a “monster’ making its way out of the sea, all-set to wreak havoc. We spoke with Rahul Singh Yadav, chief curator at Floating Canvas Company to get better acquainted with the newest addition to Mumbai –– The Plastic Monster.